Thanks for all your comments on my SOS post! 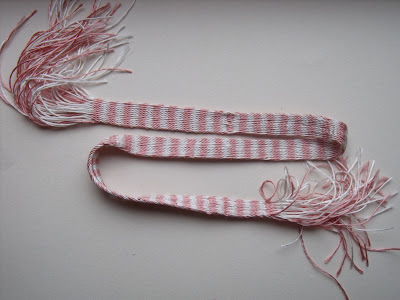 This is my second attempt, in pink and white silk (1200 dernier) from Devere Yarns. This silk gives a very smooth, soft and shiny braid :-). The braid is about 1 cm in width. In the upper row, you can clearly see the point where I reversed the directions of the tablets. It's not so obvious as in my first attempt, but I'm not sure whether I like it: it really disrupts the smooth surface... I also found it difficult to maintain the tension of the weft. I guess that in my next attempt, I have to pull the weft a little tighter, because now it really shows at the edges. Crowfoot, E., Pritchard, F., & Staniland, K., Textiles and Clothing c. 1150-c. 1450 . Medieval Finds from Excavations in London, 4. London: The Boydell Press, p 133 braid C.
A pattern of this braid can be found here. 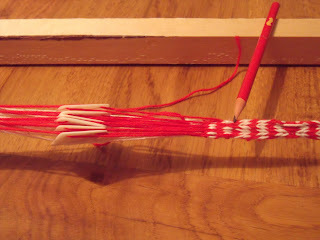 I'm trying to practice some tablet weaving, using, among others, the great tutorial from string page here. There is something I'm doing wrong, but I don't know how to correct it. 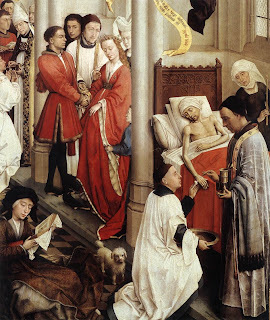 Yesterday I visited the Rogier van der Weyden Exhibition in Leuven, Belgium. It was interesting, with some beautiful paintings, scuplture and embroidery. 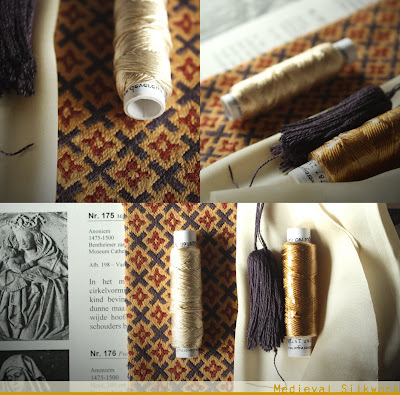 Interlacing stitches were used to sew pieces of linen fabric together in a decorative way. There are some examples of tablecloths, and of course the cap of St Birgitte. I wonder whether these type of stitches were also used for pillow cases? If you know more about this, please let us know! "The website Kunera offers access to over 15.000 badges and ampullae of religious and profane subjects. The pilgrimage sites and the sites where the objects were found are mapped out visualizing the dissemination of the objects and the travel routes at a single glance." This week I visited the museum Mayer van den Bergh in Antwerp, Belgium. It's a small, charming museum with an interesting collection of medieval art: embroidery (opus anglicanum), sculpture (wood, ivory) and paintings. 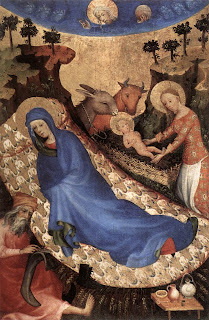 The picture below and more nativity scenes can be found here. Too bad I can't read it, but the pictures are interesting! The embroidery used to decorate the pouch raises some very interesting questions: Is gold thread used in techniques other than couched work, i.e. 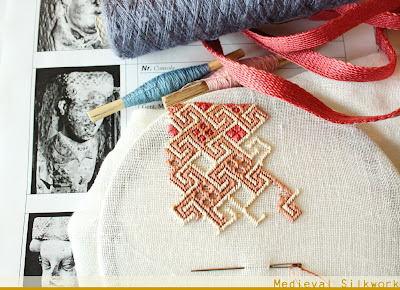 techniques in which the thread disappears at the back of the work, such as brick stitch or backstitch? If so, then how is this achieved? 2)gold thread is not flexible enough to be used in stitches such as backstitch or brick stitch. Still, it appears to me that in some rare cases, gold thread is used in techniques which involve sewing the thread through the fabric. The pouch above, for example, seems to be embroidered in backstitch rather than couched work. Tongeren, Basiliek O.L. Vrouw Geboorte. I Textiel. (1988), Leuven: Peeters. On the cover is a close up from a pouch dating from ca 1300. It would be nice to know more about this (rare) use of gold thread. If anyone knows more about it, please let us know! 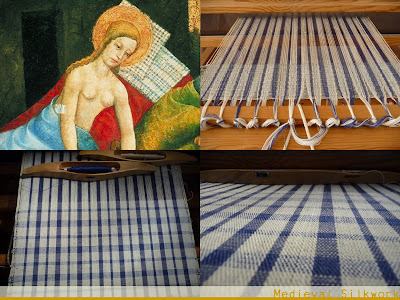 Maria from Albrechts Bösser has been weaving some custom fabric for me, to use for making medieval bed pillows. Yesterday she posted some photo's of the work in progress on facebook. The weave is made from linen yarn with a blue/white checker pattern. It is based on several late medieval iconographic sources, but the pattern is specificly taken from a 1370-1372 dated fresco from Tirol. Maria had tried to recreate the pattern of the pillow with black chekcs in the above photo, but with blue instead of black yarn. I decided to have the fabric custom made after a very long search for the perfect type of checked fabric. It seemed impossible to find. There are lots of internet stores selling antique linnen with checked weaves, but the checks are mostly red, of red and blue combined on a white ground, or the pattern of the checks is just not right. I am very happy with how Maria's work turned out, and am waiting with excitement for the moment I can hold the fabric in my hands and sew it into pillows :-). Look what arrived in the post yesterday! The new MT&C v. 5! I've been waiting a bit with ordering it, because of the price ticket, but now I got one secondhand from Amazon.co.uk for a bargain :) And it's still in mint condition too. 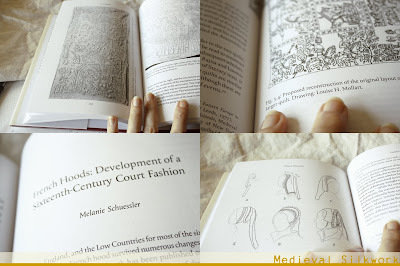 I'm looking particluarly forward to reading "French Hoods: Development of a Sixteenth-Century Court Fashion" by Melanie Schuessler and "One Quilt or Two? A Reassessment of the Guicciardini Quilts in the Victoria and Albert Museum and the Museo del Bargello" by Sarah Randles. If I only had the French Hood article at my disposal while writing my final thesis... It would have been of great help! For the full table of contents of this volume, click here. My thesis is finally finished and handed in. I can still hardly believe I wrote a book-size work (it's about 200 pages and several ten thousands of words long) in one year time! I will see what the possibilities are for publishing it in English. Any news on this matter will be put here on the blog to keep you all updated. My thesis is nearly finished. I have to hand it in coming Monday but want to have everything printed out and bound by Friday evening. I am now in the procress of editing my text. Most work I will have on putting my bibliography in order. This afternoon will be my last visit to the library to check some dates and details on written accounts. Below I have included the French and English summary/abstract to my thesis. If you should have any comments on the language, please leave a reaction to this post! I would be endlessly thankfull! Avant 1350 des fichus froncés étaient utilisés couramment dans les Pays-Bas et le plus part des pays Européens. A partir d’environ 1340 devenaient en vogue des fichus bordés avec plusieurs couches de ruches et apparaît une plus grande diversité régionale dans les genres des fichus froncés. 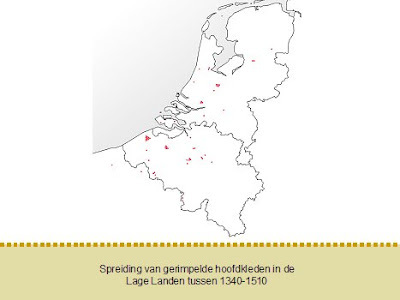 A partir de 1350 ce fichu émerge chez la noblesse des Pays-Bas et à partir des années 1360-70 elle pénètre jusqu'à la population ordinaire. Après environ 1460 la coutume de porter le ranse apparaît de disparaître chez la noblesse, par contre que chez la bourgeoisie cette coutume continue jusqu'à environ 1475 ou plus tard. Le ranse était un vêtement coûteux uniquement porté par la noblesse, les bourgeoises riches et rarement par des femmes de métier. Les occasions dans lesquelles les fichus froncés sont représentés sont essentiellement de caractère formel néanmoins pas nécessairement de caractère cérémoniel. 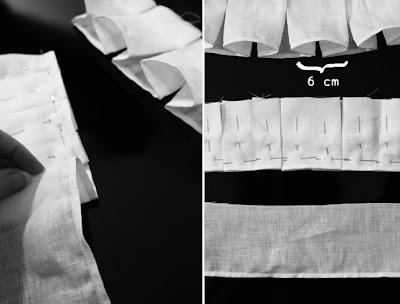 La comparaison de l’art bas Moyen Age avec des techniques de couture et de tissage (post-) médiévales nous permet d’acquérir une notion des méthodes de construction pour les faire. Les données sorties des recherches expérimentales nous ont offert une plus grande compréhension de la construction des fichus froncés, ce qui nous permet de mieux les classer typologiquement. En plus des expériences démontrent qu’on peut créer une très grande variété de fichus avec très peu de moyens et que le fichu froncé était un vêtement très multiple qu’on pourrait accommoder facilement à la dernière mode. 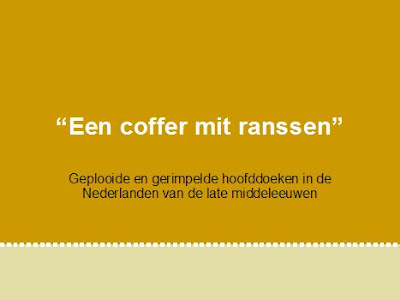 Grâce à une base de données contenant plus de 200 exemples de fichus froncés des Pays-Bas, il était possible de composer une typologie détaillée des différentes espèces des fichus de cette région. Simple frilled veils were already in use long before the mid 14th century, in the Low Countries as well as in most other European countries. From c. 1340 onwards frilled veils with multiple frilled edges became fashionable, and a greater regional variety of types of frilled veils came to be the order of the day. Around 1350 this multilayered style first appears at the courts of the Low Countries and about 1360-70 it reached the middle classes. After c. 1460 the frilled veils seem to disappear as a noble fashion, wealthy townswomen held on to wearing them until at least c. 1475. 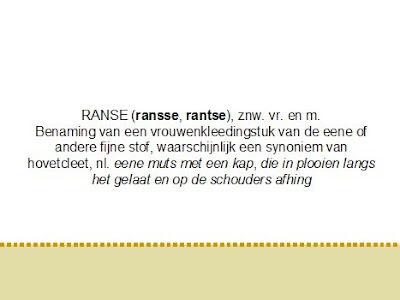 The ranse was a precious piece of female attire that was worn mainly by noble women and the citizen elite. Rarely it can be seen being flaunted by the working class as well. The occasions at which the ransen were worn were generally of a formal nature, but were not necessarily ceremonial. 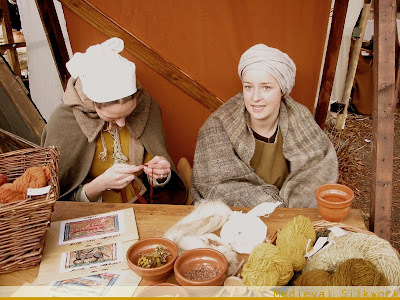 Comparisons between late medieval art en (post-)medieval sewing- and weaving techniques allow us to have some understanding of the possible construction methods used for this headwear. 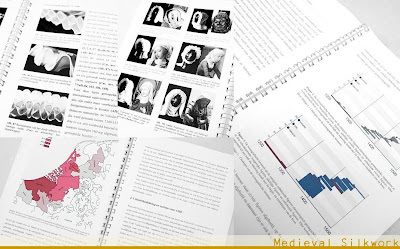 Experimental study has resulted in a better understanding of the construction and arrangement of the frilled veils, allowing a better typological categorisation of iconographic sources. 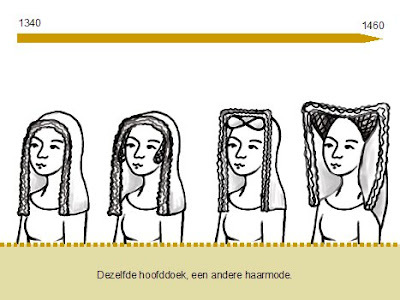 The experiments also show that with limited resources a wide variety of veils could be achieved.Thanks to the compilation of a database containing more than 200 sources from the Low Countries it was possible to construct a detailed typology of the frilled headwear in this region. The Rijksmuseum in Amsterdam has a new online exhibition: Accessorize! with a selection of the (dress) accessories in their collections. All items in the exhibition are post medieval, but very worth your time! 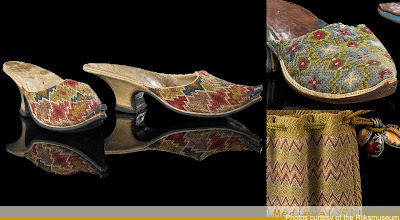 In the image above are two pairs of embroidered slippers and a embroidered purse. I call these my 'silly lasses'. They are illustrations to accompany the typology for my Master thesis. The writing is going slow: somehow these days I seem not in the mood for writing. I had lots of fun making these drawings though. I made the first drawings like this for my powerpoint that accompanied my lecture in March. Now I am completing the series with the other existing types of frilled veils discusses in my thesis. 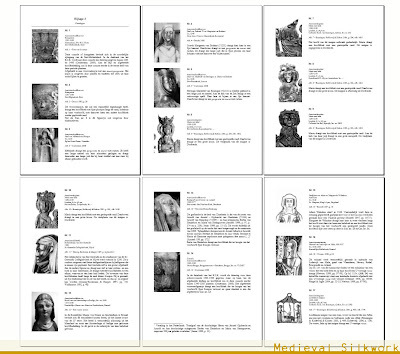 The catalogue for my final thesis is finished. It counts 81 pages and has 201 works of art/objects featuring frilled veils in it. In those 201 objects there are to be seen 228 frilled headdresses. 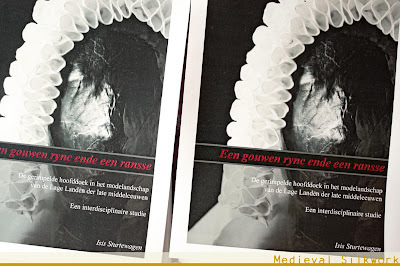 Now I'm working on revising the typology of Netherlandish frilled veils I made last year. With new pictorial evidence it is now possible to make a better division between types, and to see the chronological evolution more clearly. 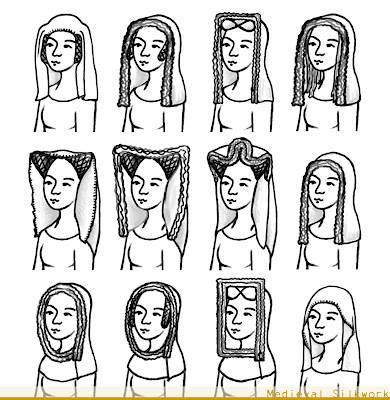 The typology chapter will consist of small explenatory drawings showing a prototype of each subtype of frilled headwear, accompanied with a text giving more information about when and where the type was popular, and in which ways it was worn. There will also be references to the items in the catalogue of that particular type. Included in the typology chapter will be a timeline with frilled headwear types. Ah, I got work to do! In the mean time I have ordered fine linen fabric to use for the veil. 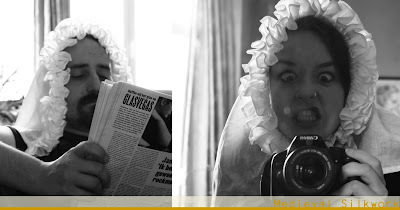 I've been doing some calculating for the frilled veil I'm making for Maria from Albrechts Bössor. I figured the frilled edge should be ca. 70 cm long and the edge of the veil itself ca. 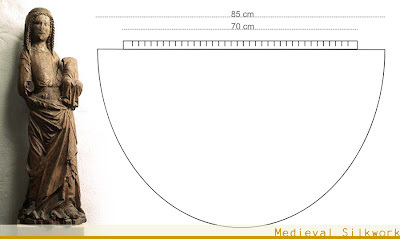 85 cm, in order to resemble the veil on the statue. 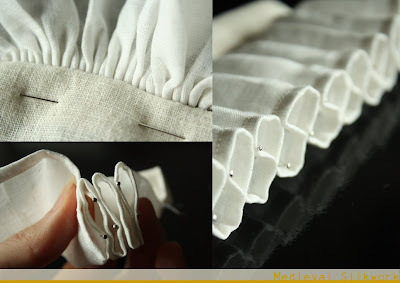 The frilled edge will consist of two layers of fabric worked in frills of each ca. 1,75 cm wide. There will be ca. 40 pleats in total. And now I remember where I saw this type of frills earlier. 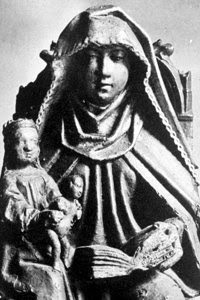 It was on this Netherlandish statue from the 15th century of St.-Anna-ten-Drieën (Saint Anne, the mother of Mary). It was made by an anonymus sculpturer, and is now in a private collection. 2. 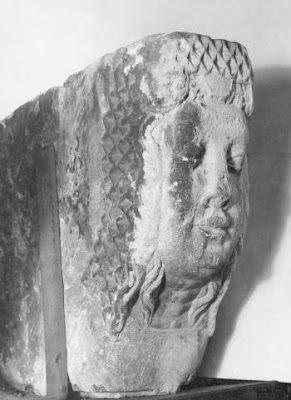 Hakendover, Goddelijke Zaligmaker Church, 1400-1404, statue was part of an altar that is partly preserved, but the sculpture in the photo is now stolen. You could already see a peek of this statue here. 3. Mechelen, Hof van Buysleden, late 14th or early 15th century. 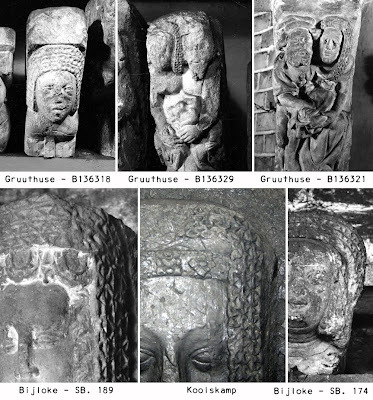 These sculptures show a very similar style of headdress. On fig. 1 you can see a female head console with a single layered wavy frill on her headdres. Fig. 2 wears to layers of wavy frills on top of each other. In fig. 3 two layers of fabric are worked into one wavy frill. Here is my reconstruction before starching, hence the pins still being in place. This is just a small sample. I didn't attach a veil part to it, just a small strip of fabric to attach the frilled edge to. More detailed descriptions of all the experiments will be in my final thesis. The inventory with frilled headwear is now 72 pages long and nearly finished! YAY! 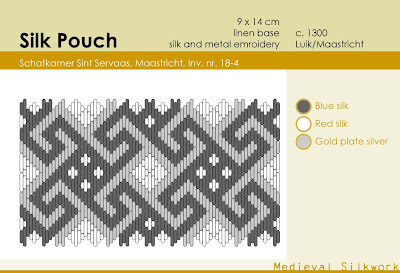 I also found the time to finally upload the promised pattern/information sheet on the Maastricht purse. Find a pdf-file with the pattern and more information and photo's of the original here. A tiny bit of progress! I added a touch of strawberry red and I decided the tassels of the purse should be blue. I'm not sure which type of tassels I should pick this time. Tassels with turk's head knots, pompom's with a turk's head knot or maybe even just the knots without tassels or pompoms. I always seem to be doing a lot more things at moments I have very little time. It's isn't any different right now. I started a new embroidery yesterday. It's going slowly, but it is a good thing to do during my small breaks away from the computerscreen in between writing sessions. I'm using DevereYarns loose twist 1200 denier silk. It is the first time I use this type of yarn for embroidery (I have been using it in the past for fingerloop braiding and tablet weaving), and I really love it. It is so shiny and smooth and it looks so much like the silk used on original medieval purses. Machteld did a comparison between spun and filament silk some time ago. 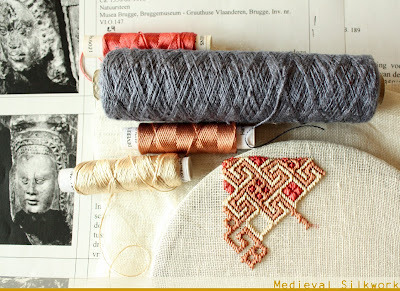 More recently Kathy from Medieval Arts & Crafts did a comparison between different types of embroidery threads that is interesting to take a look at. I decided I will not ever use a different type of thread to do silk embroidery ever again :-). The pattern of the embroidery will be the same as I did on this one, except I won't be adding the coat of arms. the pattern is based on a ca. 1300 purse in the Sint Servaas treasury in Maastricht. 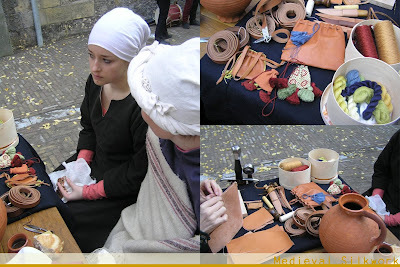 the purse originates from the Liege/Maastricht region. I have made an information sheet on this purse in a pdf file, including the pattern and a photo of the original. I will be putting it in the new 'downloads' section on the blog soon, so keep your eyes open! In the background you can see an image of a console from Diest, Belgium. It dates back to the second half of the 14th century. Winding up my naturally dyed silk yarns on reels is one of the things I have been doing these days besides writing. 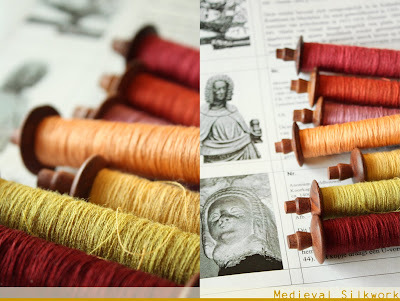 The spools are based on a 12th century find from London. It's the only reel find I know so far, I'd be happy to hear about other finds. Mikkel from the Danish blog Haandkraft made some really lovely reels loosely based on the same London find. In his post you will also find a photo of the original. I really like to use these yarns for making tassels and braids. You can also see some late 14th - early 15th frilled veils in the background as well. Fragments of paper with parts of my catalogue are cluttering every table in the house! I am working on a new series of experiments with frills. The example is a chimney/hearth console from Bruges, in the collection of the Gruuthuse Museum. 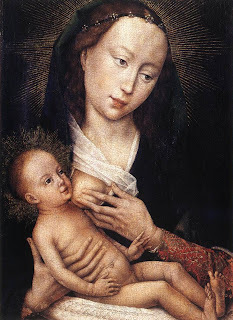 It is dated to the late 14th century. Next to it is the first sample I did. I am not completely satisfied with the result yet. The two outer rows of frills do not stay in place as they should. 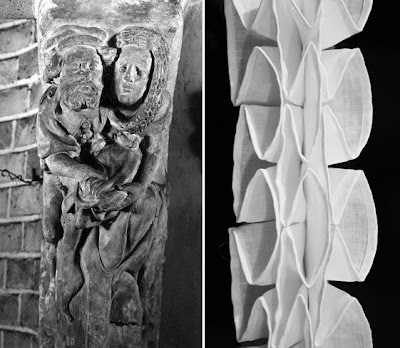 Above are some other examples of frilled veils from the Low Countries with box-pleats. 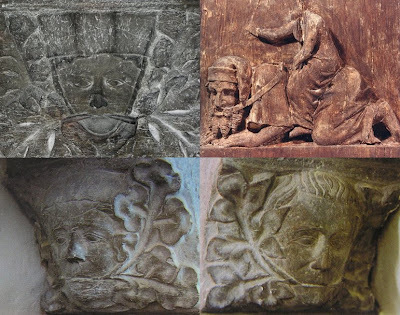 The three on the top row are also in the collection of the Gruuthuse Museum in Bruges, on the bottom row the one on the left and the right are currently in the collection of the STAM museum. All date from the last quarter of the 14th century. Above are two photo's of the progress. Does someone have a clue what these figures with bits in their mouths stand for? In the case of the male heads I can imagine it might have to do something with the legend of Aristoteles and Phyllis (see also fig. 2). Aristotle, the Greek philosopher and tutor of Alexander the Great, allowed himself to be humiliated by the seductive Phyllis, Alexander's favorite courtesan, as a lesson to the young ruler, who had succumbed to her wiles and neglected the affairs of state. 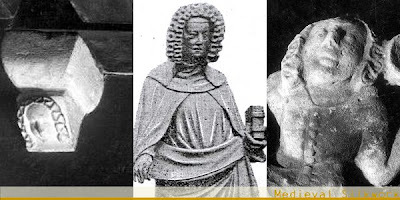 Encouraging Alexander to witness his folly, Aristotle explained that if he, an old man, could be so easily deceived, the potential consequences for a young man were even more perilous. However, I can not see why women would also be depicted this way and what the meaning is that is hidden behind it. Any information on this matter would be greatly appreciated! Prefix: A short version of this post is also available in Dutch. 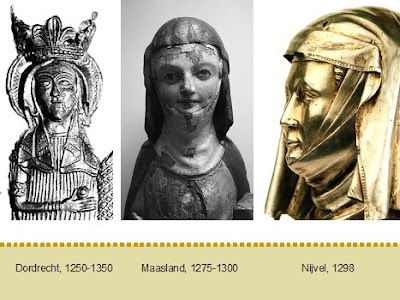 An extensive article on medieval women's caps and the cap of St. Birgitta (a Swedisch saint of the 14th century) is to be found in: Dahl, C.L. 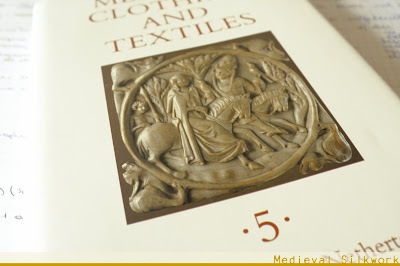 & I. Sturtewagen, 2008, The Cap of St. Birgitta, Medieval Clothing and Textiles vol. IV, pp. 99-129. White fabric caps can relatively often bee seen on women in medieval art from the 13th to 15th centuries. Examples are known from Italy, France, The Low Countries, Scandinavia, ... These images can teach us much about how the caps were constructed and how they were worn. Fig. 3 in particluar is very interesting because we can see the ties are not two seperate ribbons, but form a loop. On fig. 4 a seam on the back of the cap is clearly visible. 2. Tacuinum Sanitatis, c.1390, Paris, BNF, MS. Lat. Acq. 1673, fol. 11r. 3. Les Cent Nouvelles Nouvelles, Frankrijk, c.1475-1500, Glasgow University, MS Hunter 252, fol. 186r. 4. 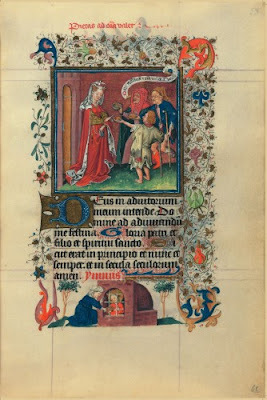 Liturgische kalender uit Kamerijk, 1275-1300, Den Haag, KB, 76 J 18, fol. 211v. Also written sources give information about women's caps. The word that is regularly used in Dutch witten sources is 'huve' or 'huvete'. 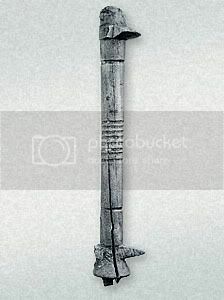 The word 'huve' is not exclusively used for female headgear, but also for men's. For a more detailed discussion about the terminology of women's caps see Dahl, C.L. 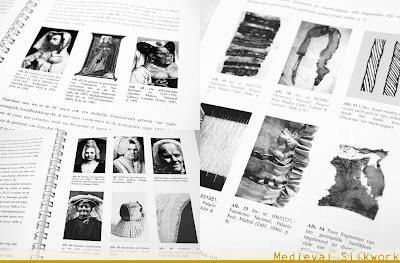 & I. Sturtewagen, 2008, The Cap of St. Birgitta, Medieval Clothing and Textiles vol. IV, pp. 99-129. Item off twe vrouwespersonen sick onder een ander dat huvete afftogen kijflicken, dat is vijff marck, Westerw. Landr. 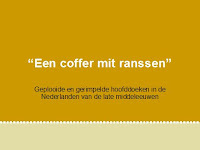 53, 3 (Source: Middelnederlandsch Woordenboek). TRANSLATION: About two women who quarreled and ripped each others 'huvete' [= cap] away, that makes five 'marck' [=monetary unit]. Van huven, die sy voir mire vrouwen gecoft hadde, Oorl. v. Albr. 308 (Source: Middelnederlandsch Woordenboek). TRANSLATION: Of 'huven' [=caps], that she had bought for my lady. Other written sources (eg. the ca. 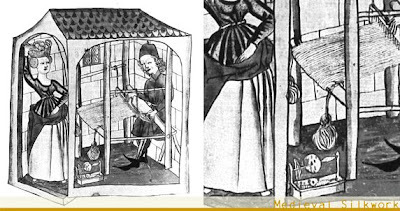 1370 Bruges Livre des Métiers) tell us that huves could be made in silk or in linen and that they were often worn underneath a veil, which makes total sense. This may be the cause of the fact that women's caps are much more rare in iconographic sources than the well known male coifs. However this does not necessarily mean that they were worn less regularly. Also the caps for a good base for pinning upper veils to, and they are a less labour intensive alternative to knotted silk hairnets. 5. 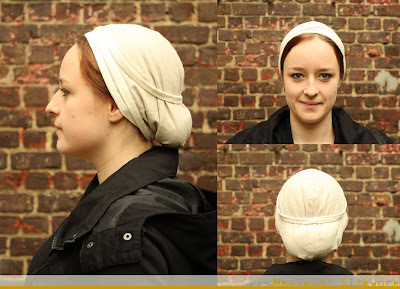 The cap of Saint Birgitte in the Birgittine Convent in Uden, photo's by Isis Sturtewagen. An original medieval cap (dating between the 13th and 16th centuries) is in the posession of the Birgittine Convent in Uden, The Netherlands. 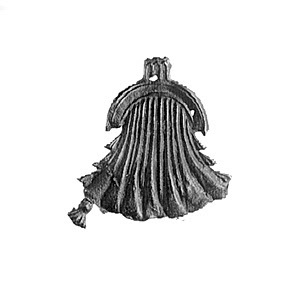 This cap is believed to have been Saint Birgitta's of Sweden and is kept as a relic. On this original the ties were broken, so it is not completely clear wether it were two seperate ties of one loop similar to the cap in fig. 4 however it is very probable they formed a loop. This is also how the cap was restored during the conservation in the ealry 1970's. 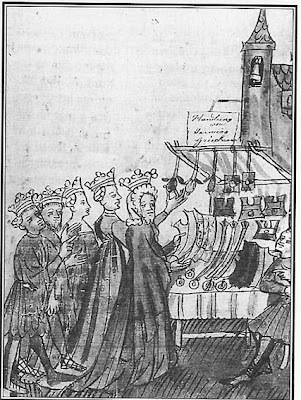 The women's caps could have been worn in different ways, depending on how long the loop was en how many times it could be wrapped around the head. The method above is the same as we can see in the Maciejowski Bible and Tacuinum Sanitatis. Above is my own attempt on making a women's cap. 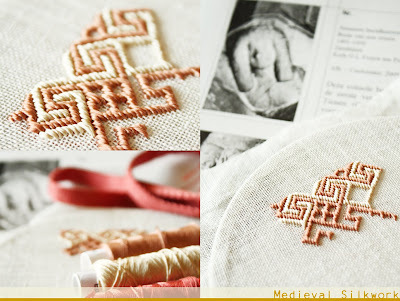 It is made out of linen and lacks the emroidery that was found on the cap of Saint Birgitte. I plan on making a silk 'huve' somewhere in the future which will have all the embroidery applied to it. I showed you a couple of reconstructions of the cap in a previous post on this blog. 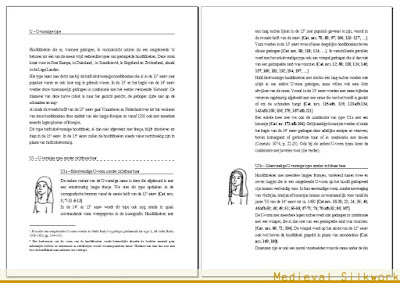 Catharina Oksen (from the Middelaldercentret in Denmark) has also made a lovely reconstruction (text in Danish).